The first //SEIBERT/MEDIA client to introduce a Linchpin intranet into their organization was MEYER WERFT GmbH & Co. KG. The German shipbuilding company, which has been in business since 1795, is renowned for its shipyard in Papenburg. For over 200 years, the experts at this family-run business have built numerous ships. To compete internationally, production technology had to be on the cutting edge. Today, MEYER WERFT has the most modern shipbuilding facilities in the world. 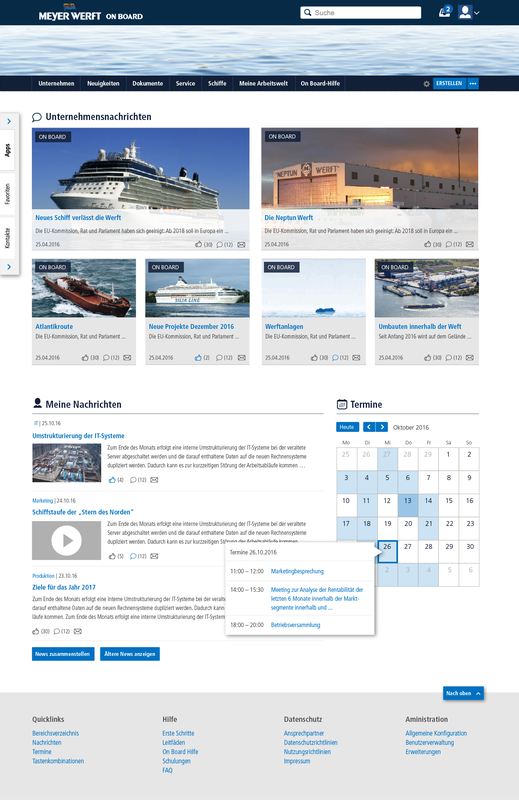 MEYER WERFT's goal was to have one Confluence-based intranet that could serve all of its different locations. This new intranet would need to be available in different languages and allow for personalization among its 3,500 users. The company also wanted to establish a user-friendly communication channel in order to share company news and other important information. On Board is a project focused on creating a digital collaboration platform that would include Confluence, JIRA and Sharepoint. This intranet project aims to provide communication channels, information and services, as well as create a foundation for technological expansion within On Board's environment (Linchpin). Currently, the company is developing a quality management system based on Confluence, and different processes and operations will soon be available in JIRA. Custom design: The intranet is equipped with a Confluence theme that corresponds to the corporate design and color scheme that employees are familiar with. Additionally, the standard Confluence interface has been improved to make the intranet a more user-friendly tool for completing daily tasks. Global navigation: The intranet has global navigation menus that can be tailored to different user groups. Other personalization options are being planned for the project's near future. Personalized app center: From the intranet home page, users can click on internal and external applications that are relevant to them. They can also decide which applications are displayed. This feature provides users with recommended apps by default. Expanded user profiles: Thanks to expanded user profiles, there is now a way to find the right people for specific tasks. Users can be quickly identified according to keywords with a single search. News channels: Company news can now be targeted specific groups (for example, restricting news items to smaller groups). For now, this feature is based on existing content, but further enhancements are planned for the next stage. Integrated use cases: Specific use cases supported by the intranet include a discussion forum, carpool center, and a bulletin board (offers/search). More are going to be added. The intranet has a user-centered design and development is an agile process involving users from an early stage (user-centered approach). For our client, the intranet relaunch has been a successful agile pilot project. What does our customer think about working with us? Wolf Wolzenburg, Solution Coordinator and Architect at MEYER WERFT, was kind enough to speak with us about this project. He talks about the Linchpin intranet introduction within his company, the advantages and disadvantages of collaboration, and //SEIBERT/MEDIA's Atlassian Enterprise club. We are looking forward to a successful project and further collaboration with MEYER WERFT!